"Sybarite: A general term for describing one fond of pleasure and luxury"
let me introduce you to The Sybarites. in 2005 under the name and banner of Superfrock Ltd / Superdoll. 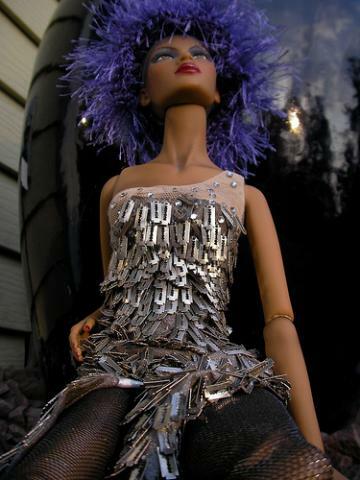 Charles Fagan previously worked in the fashion industry and his dolls reflect the high end of fashion industry. No strangers to the fashion doll scene they both created a one off high end corture outfits for Robert Tonners Tyler and Mel Odoms Gene Marshall etc. many different designs in wigs, although the dolls are supplied with two hair pieces, The dolls are similar to the japanese BJDs which are more childlike in appearance the sybarite limbs are fully articulated and strung together with elastic and have 17 points of articulation so therefore they can be posed beautifully and more life like. Early dolls were produced in London at first but as they became more popular with collectors it was decided to move the production to China but the dolls are still produced in very limited numbers. Sybarites are not for the feint hearted you would not call them pretty dolls some of them come across as quite scary, there faces have heavy and elaborate make up and sybarite's dont do smiling either which somewhat adds to there scary appearance. The Sybarite fashion doll collection are aimed purely at the serious collectors market and in there short time have quite a following in the United States and in Europe like France and Germany and then of course they have a great following in Japan. Then doll has been produced to the highest quality this also goes without saying and her outfits are to the highest standard,this does also reflect that the sybarite doll can become very expensive as do her outfits also but you will always pay for quality and craftmanship after all , Sybarite's have featured in many fashion magazines and is featured in great detail by the American Haute doll magazine where she has been on the cover on numerous ocassions and is featured on many fashion shoots, she has even had her own seat at the Dior fashion show, also she was featured at an exibition in 2007 at Jeffrey New York she was displayed in a purely white collection which had a very controversial theme to the collection. A gift set containing 'Blade'a special event doll and was limited to 150 dolls, she came with a white satin pantsuit and a white lingerie romper with matching shoes and accessories and an out of this world cocktail dress made of hand sewn miniature razorblades, one could say it is cutting edge fashion! Sybarites are roughly the same size as Gene Marshall and Tyler Wentworth and can fit into there many outfits, the general impression I get about these somewhat interesting fashion dolls is that the designers look upon these dolls as a work of art and not that of a fashion doll I know that I have made my mind up about sybarites along time ago this being that there overall appearance is unique to say the least and that there outfits and the hair pieces etc certainly makes them very interesting, maybe one day I will get my hands on one that I know for sure its all a question of when and how I suppose. As with high fashion,the doll collections are produced to a theme which best explained by the designers, however the collections are spectacular and of the highest quality,gift sets can reach four figure sums today and new launches of Sybarite dolls can expect lavish attention with regards to there release just check out some of the haute doll magazines for example,also in 2008 a collection called 'War and Peace' was lauched at a 16th century establishment and with all the glitz and excitement of a full sized fashion show. From what I have seen so far I think the " Sybarites " are very nice dolls and have already formed a huge fan base ,but I'm sure there is room for more with regards to making them more accessible in the United Kingdom and producing more affordable versions but still with that Sybarite personality and style. If youre a collector of Sybarite dolls we would really love to hear from you with regards to your thoughts and experiances of owning these interesting additions to the fashion doll world, please feel free to leave your post on our facebook site.